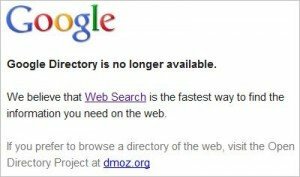 Google has killed Google Directory. The site was a copy of the Open Directory Project (DMOZ). I wondered for a long time why Google – who is king of anti-scraping and duplicate content penalties – was presenting the exact same content of DMOZ. 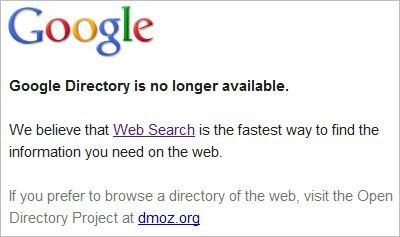 I was literally looking in the directory yesterday to see if it was still an exact copy of DMOZ. I guess nobody visited the directory so Google took it down. One big indicator of the fact that nobody used it was that Google dropped the search box from the page sometime last year which forced people to drill into the directory to see find a site based on a category. That makes sense since Google already presents results by search query in the main engine. I think they must have dropped the box to test if anyone would actually use the directory to find a site – and they didn’t. I wonder if DMOZ will be the next major site from the “old internet” to die. It seems like the only people who use DMOZ anymore are people trying to get their sites listed for the PR and reputation.